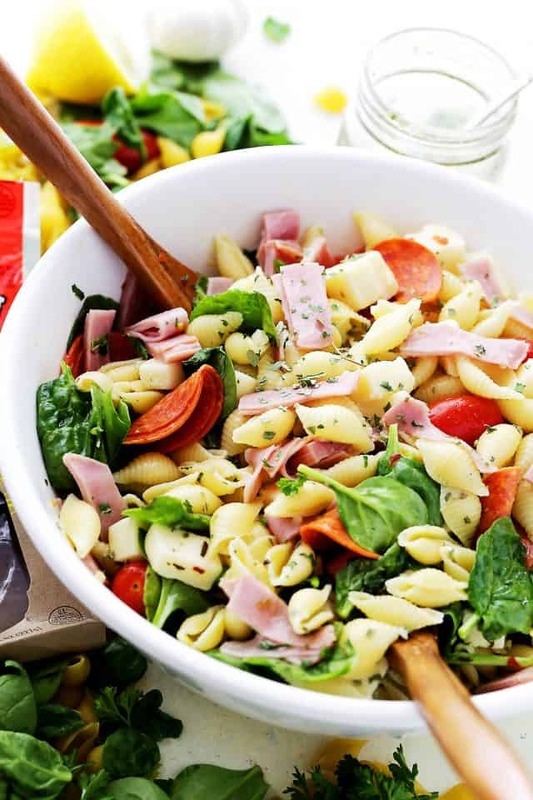 Italian Pasta Salad Recipe – Loaded with all your Italian favorites, like pepperoni, ham, tomatoes, spinach and cheese, this is the perfect pasta salad for any cookout, picnic or light summer meal. 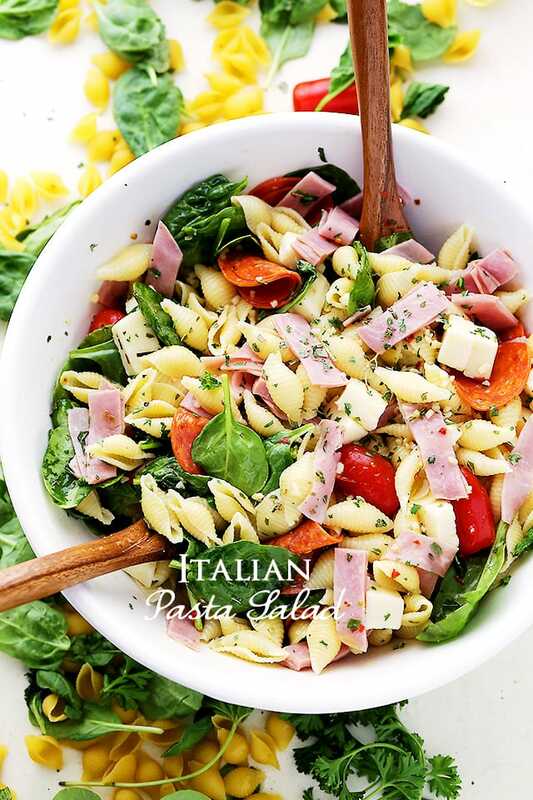 Nothing says delicious and convenient like a fast, fresh and easy Italian pasta salad. Hey Hey! Happy TGIF! Let’s put carbs back in our rotation, please, and let it all start with this amazing concoction of pasta with pepperoni and cheese and tomatoes and et al. There are endless ways to make a pasta salad, and if you’re anything like me, you try to create a more nutritious pasta meal by adding good-for-you ingredients and sneaking in leafy greens. And no creamy dressings. A light Italian Dressing is all we need here. But, staying real for a moment. I am in the camp of believing that nothing says quick, convenient, and all the while delicious, like a fast, fresh and easy pasta salad. And with so many variations, it’s a foolproof main dish or side dish to bring to the table, to any backyard barbecue or to a potluck. Also, since big salads are meant to be shared, call the neighbors over, have a pool party and ENJOY! 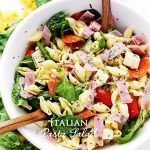 Italian Pasta Salad Recipe - Loaded with all your Italian favorites, like pepperoni, ham, tomatoes, spinach and cheese, this is the perfect pasta salad for any cookout, picnic or light summer meal. Cook the pasta shells according to the directions on the package. Drain the pasta shells and run under cold water until completely cooled; pat dry with paper towels. 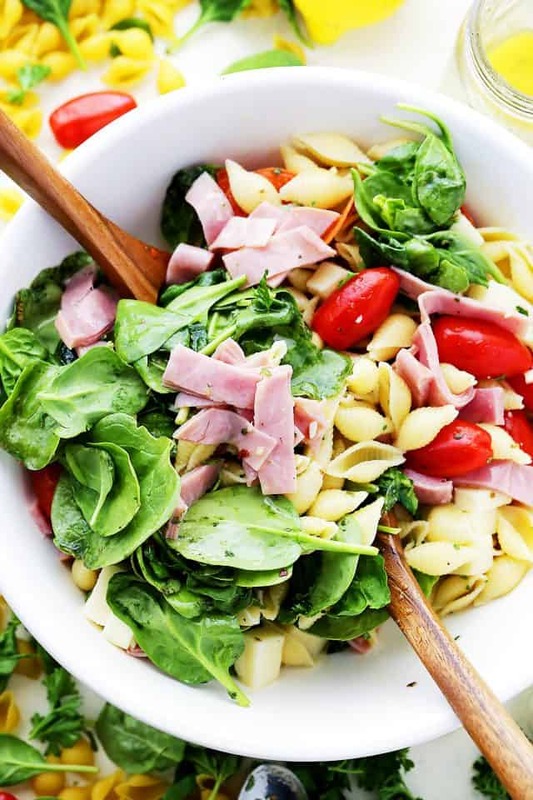 Combine pasta, ham, pepperoni, spinach, tomatoes and cheese in a large salad bowl. Gently toss salad with Italian dressing. I love Italian food, and pasta salad is my favorite. I like how this pasta salad is full of a lot of different meats, I bet it makes it pretty filling and satisfying. I would love to try something like this, but I am not a great cook. I will have to see if I can find a restaurant that serves something similar. What a fun salad for a picnic….I am so excited the weather is getting warmer! Perfect for summer! Might need to make this for our cookout this weekend! That looks soooo good, and so perfect for a picnic or BBQ! I love any type of pasta. Yours looks amazing. Loving all the fresh colors! Looks very tasty. 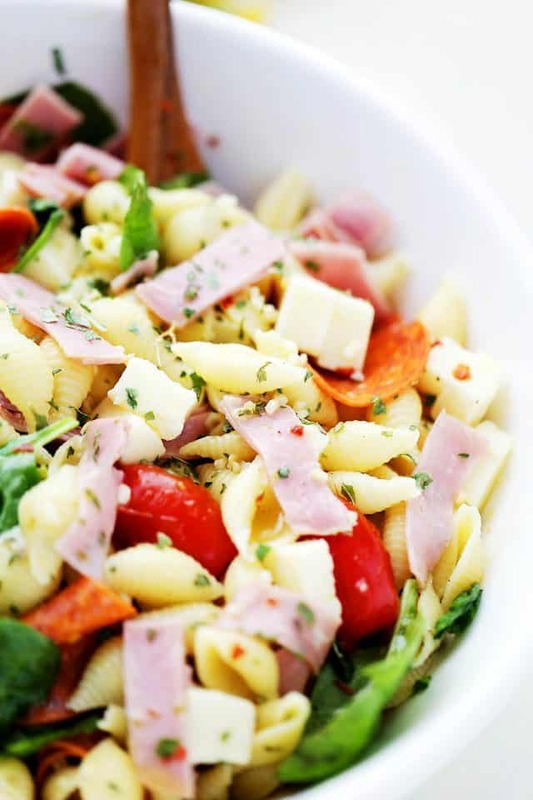 Nothing says summer to me quite like a delicious pasta salad! This is a winner! This dish is just bursting with flavor!